Thanksgiving night I was curled up on my daughter’s king-sized bed with her, my two grandkids, and granddog watching a movie – then, I remembered there was a party going on at Kate’s and I grabbed my Kindle to check in. TweetChat wasn’t at peak performance but I did manage to say hello and get “the word” for Five Minute Friday! What a perfect word for this week’s five-minute free write. 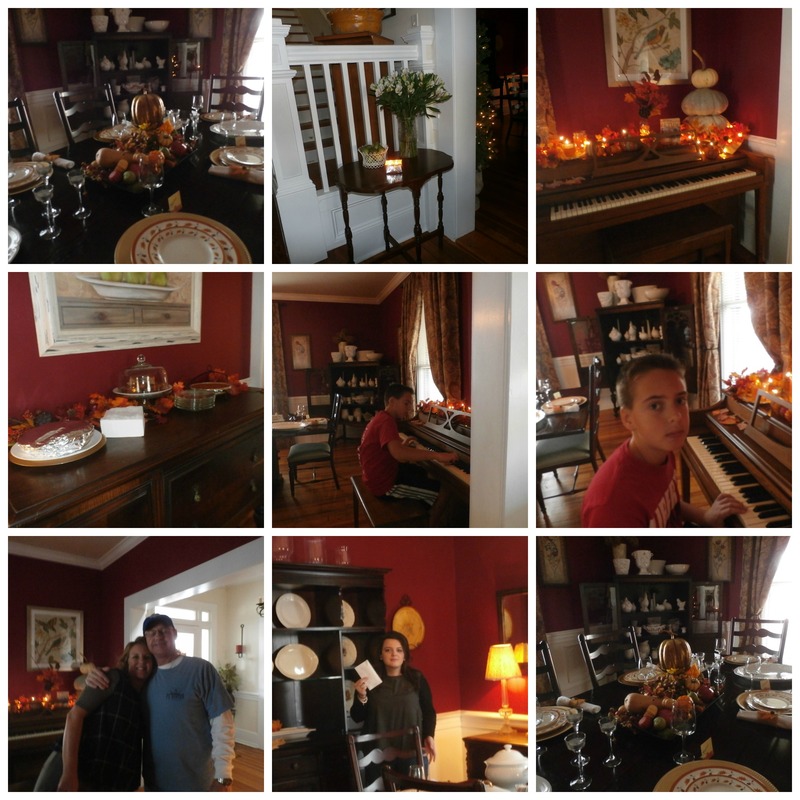 The photo above is the table we gathered around Thanksgiving 2015, at my daughter’s and son’s in law home. But what I want to write about is what is ON the table. The dishes, with leaves and acorns around the border, were my wedding gift from Grandma Emily and Grandpa Harold in 1967, all three of my children were raised eating from these dishes. They’ve been packed away forgotten. Today, we filled them with wonderfully traditional fare: turkey, stuffing, gravy, mashed potatoes, cranberry sauce, green bean casserole, corn spoon bread, and dinner rolls. The soup tureen on the left? That was my daughter’s last gift from my mom; purchased mid-October 2012 to be a Christmas gift but my mom caved and gave it to her early. Two weeks after, Mother entered the gates of heaven. The milk glass in the corner cabinet? Several pieces from family members long gone. 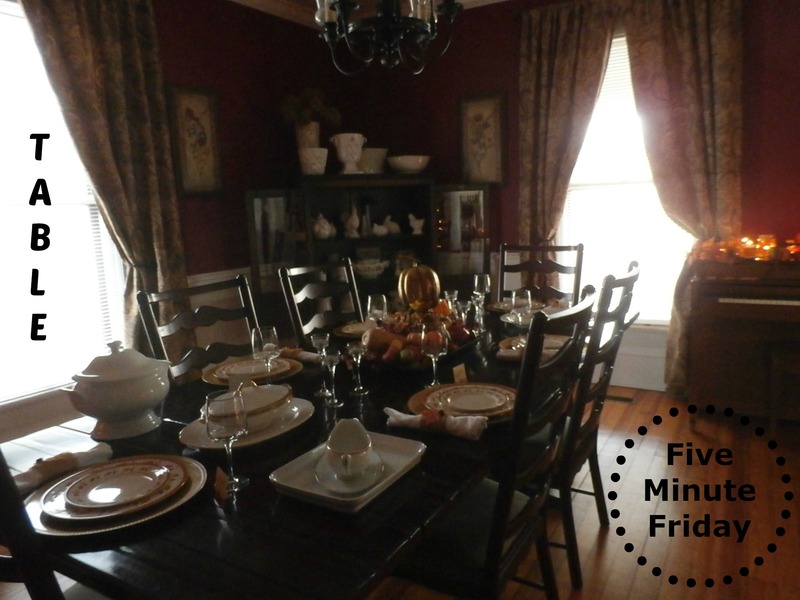 There were only six of us around the table this year – yet, the memories of loved ones, by way of dishes and trinkets, filled the table with a heavenly warmth and we were blessed. And you shall set the bread of the Presence on the table before me regularly. Today, God’s presence is His Holy Spirit and He has a welcome place at our Table! Beautiful table but the stories surrounding what’s on the table are priceless. It really is all about family and love and those gifts are so much more precious when given and received through the love of our Father for us. The only real thing that matters. What a lovely post, and such heartwarming pictures! I wasn’t really able to eat any kind of Thanksgiving dinner – the attempt was rather unpleasant – so I sat on the kitchen floor with my service dogs, smoking a cigar, while Barbara watched a football game. Smoking a cigar? YUK! But, hey…at this point? I would have thought the cigar would have been more unpleasant… no need to explain, I can guess, 🙁 Men sometimes have these strange traditions hehehe…glad you were able to have some enjoyment Andrew! Shane has often thought a pipe would be pleasant; but we’re a part of Samaritan ministries now as such, he can’t smoke ANY tobacco products. Great post. My aunt and uncle’s house is full of items like that that he has found on the farm from generations past. They are all such special pieces just like yours. Sounds like you had a great day. We did too! What a beautiful post! Wonderful memories to remember and traditions to have. What a precious last gift story for your daughter. <3 this so much! Christy, thanks for coming by on this busy weekend! Iena, I love seeing new people dropping in here – Thanksgiving is my favorite holiday, even over Christmas! What beautiful heritage pieces to be surrounded by. Sounds like a wonderful day. It was, Jodi. Thank you for coming all the way from Australia to say so!!! Susan, sounds like you had a wonderful Thanksgiving and I love how you share the meanings and stories behind the special items on the table. Love that you all piled in the bed together afterwards to watch a movie! Christina, that’s the way we roll!!! What beautiful memories to be made and mixed with the prior memories! Glad you had a wonderful Thanksgiving! Thank you Kadie for coming by. What a beautiful and meaningful Thanksgiving table! Barbie, it was a lovely table! Glad you exhumed this post for the occasion! We have my mother-in-law’s dishes and they always make holidays more festive. Really looking forward to Thanksgiving!